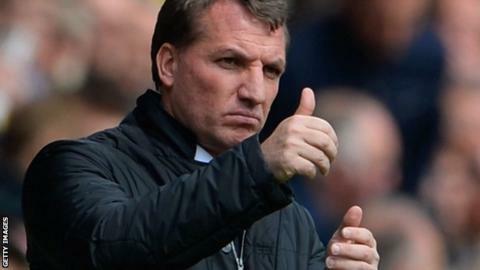 Liverpool manager Brendan Rodgers insists all the pressure will be on Chelsea when the sides meet on Sunday. The Reds need seven points from their last three games to guarantee a first league title since 1989-90. A Liverpool victory at Anfield would also end Chelsea's hopes of winning the Premier League trophy. "Everyone talks about pressure but that is Manchester City or Chelsea - when you spend that sort of money and expect to win the league," said Rodgers. "I don't think there is pressure on ourselves, only what we have from within. Look at Tottenham ... [when] you spend over £100m you'd expect to be challenging for the league. "People talk about pressure but it's absolutely wonderful." Rodgers, who succeeded club legend Kenny Dalglish as Liverpool boss on 1 June 2012, is well aware of the threat posed by Chelsea, even though the visitors will be without a full-strength team. Jose Mourinho has suggested he will rest key players at Anfield ahead of their Champions League semi-final second leg against Atletico Madrid on Wednesday. "They are an outstanding team with lots of good players and a world-class manager," Rodgers said. "Of course you have to look at the opponents' strengths and be aware Chelsea's qualities are on the counter-attack - they have fast players, they will sit deep in a low block with men behind the ball. Liverpool v Chelsea - who will win the battle at Anfield? Mourinho, who travelled to Liverpool alone because he was feeling unwell and did not want to pass anything onto his players, refused to discuss his selection plans on Friday but Rodgers said he did not think the Portuguese was playing mind games. Rodgers worked under Mourinho at Chelsea between 2004-2007 and said: "Jose's a winner, he won't give up. "There's certainly no mind games from him towards me. He knows me well enough to know that it wouldn't bother me one iota what anyone says or does. "I've seen some things written about them playing a weaker team but I think it's hugely disrespectful to their players if they're deemed to be the weaker ones in the squad. "Whatever team they put out, it'll cost more money than ours and it'll be more experienced than ours." Liverpool are now guaranteed a place in the Champions League for the first time since 2009 as they can finish no lower than third, but their supporters are targeting a first league title in 24 years. "For us, it is about us playing our game and the opponent worrying about our strength and us ensuring we are close and compact when we haven't got the ball," Rodgers said of the crunch encounter with Mourinho's team. "Thankfully for us, we're playing at Anfield, where we have great support behind us and they'll be important. "We don't change. We are a team who are very aggressive in our attack."